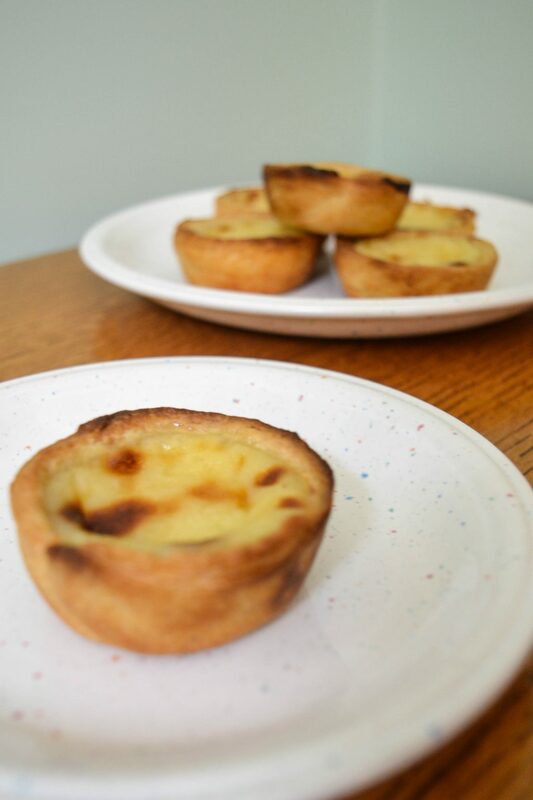 Pastry week’s technical challenge gave us the perfect excuse to have a go at making pastéis de nata! Pastry week is always one of our favourites and this year was no different and the cherry on top of the pie was that Liam got star baker! He’s definitely become one of our most loved contestants this year (Sophie also gets a lot of our affection). 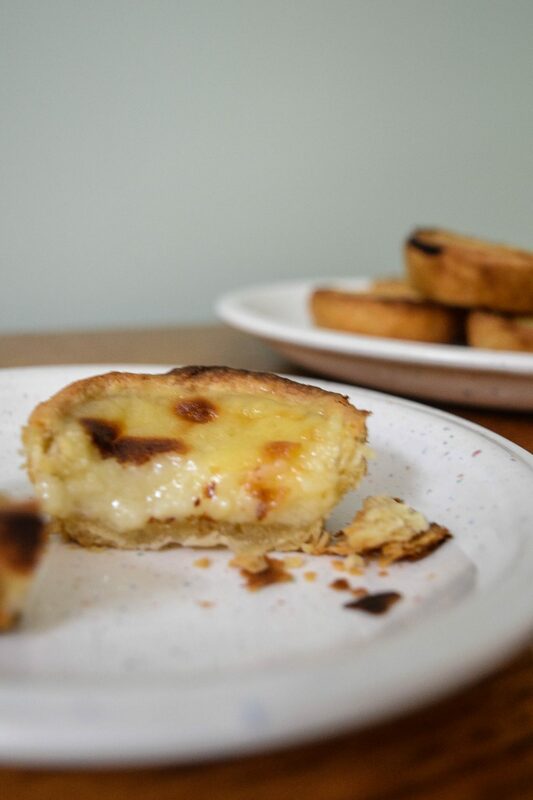 We really like that pastry week takes away a lot of the decorative elements in a challenge and puts a lot of focus on the technical aspects due to the nature of the bake, you can’t hide a soggy bottom! 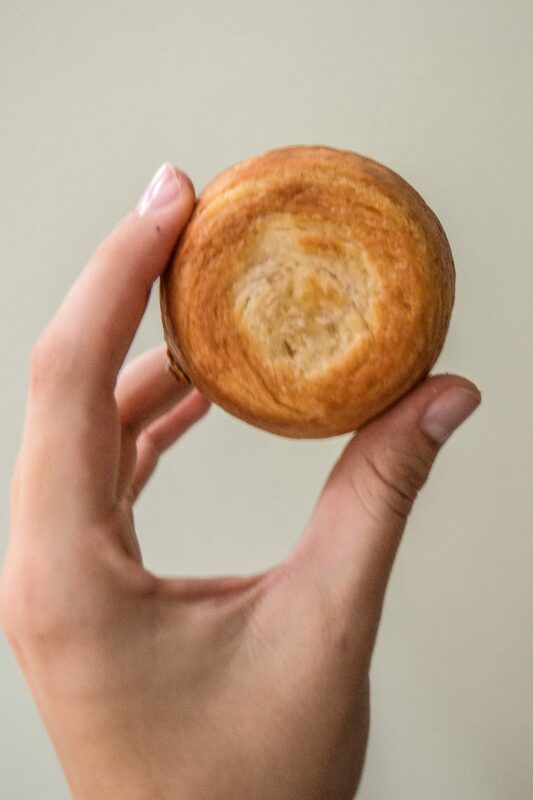 First things first was the pastry, and in the spirit of the technical we made it from scratch, rough puff is way easier to make than traditional puff pastry, the initial dough and folding just seems to take much less time. 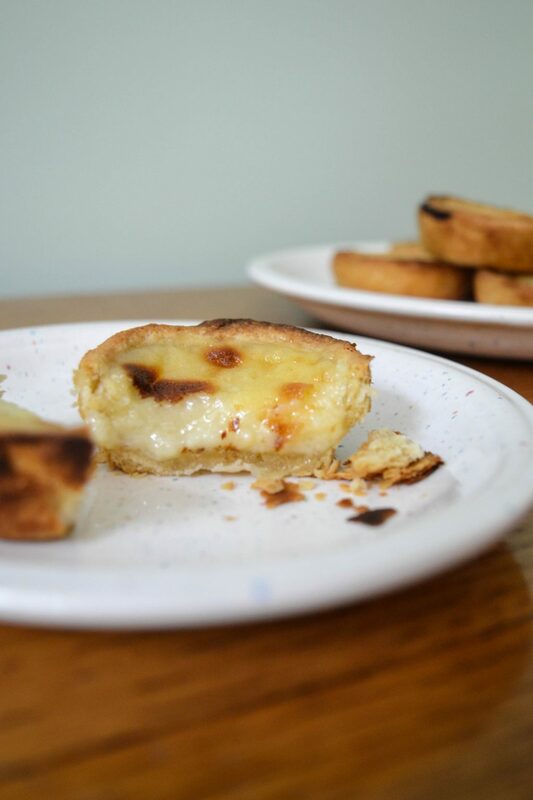 Once you’ve rubbed together the butter and flour you bring it together with water – so it’s very much like a shortcrust recipe, then grate butter over 2 thirds, fold over, grate the rest of the butter, fold, roll and then fold again… then put it on the fridge and roll and fold again! (And then do that again). 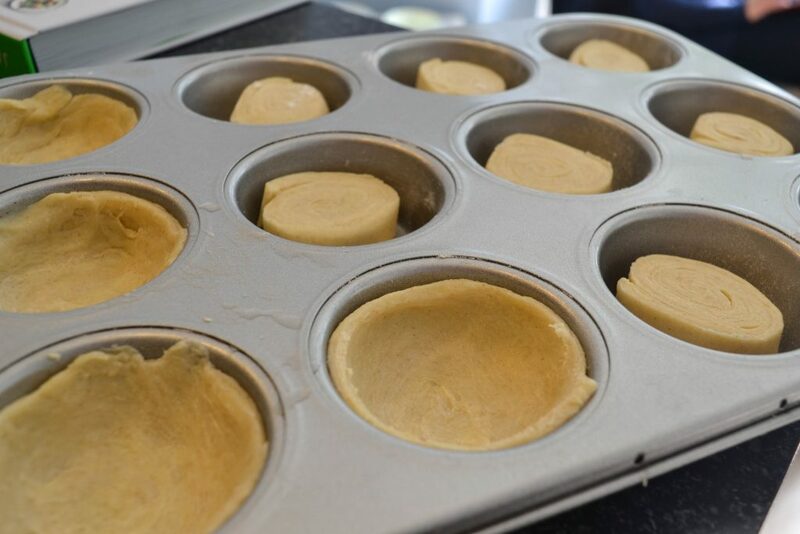 That’s the easy part done, next is making the cases, in the recipe it says with wet fingers – and definitely listen to this, it makes it way easier to push the pastry up the sides of the tin. And if while you’re doing it you keep things, i’m destroying this pastry and i’m going to have no swirl then you’re on the right track!! We spent the whole time thinking that but it all turned out okay, swirls and all! Mix the flour and salt together in a bowl. Rub in the chilled butter using your fingertips until the mixture resembles breadcrumbs. Gradually add enough water to form a dough (about 4-6 tablespoons of water). Roll the dough out into a rectangle on a lightly floured work surface. Grate half of the frozen butter over the bottom two thirds of the dough. Fold down the top third and fold up the bottom third as if folding a letter. Turn the folded dough through 90 degrees and roll it out into a rectangle again. Repeat the process of adding the remaining frozen butter and fold as before. Wrap the dough in cling film and leave to rest in the fridge for 20 minutes. 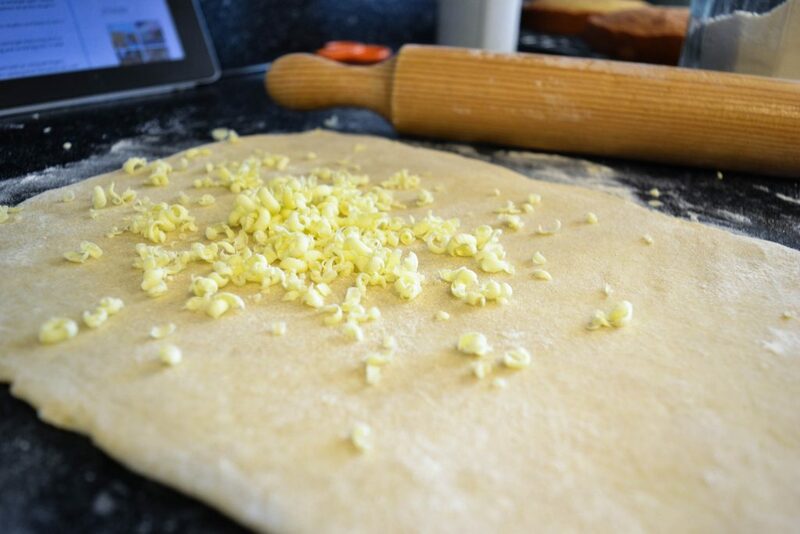 Roll and fold the pastry twice more, then wrap the dough in clingfilm and leave to rest in the fridge for 20 minutes. 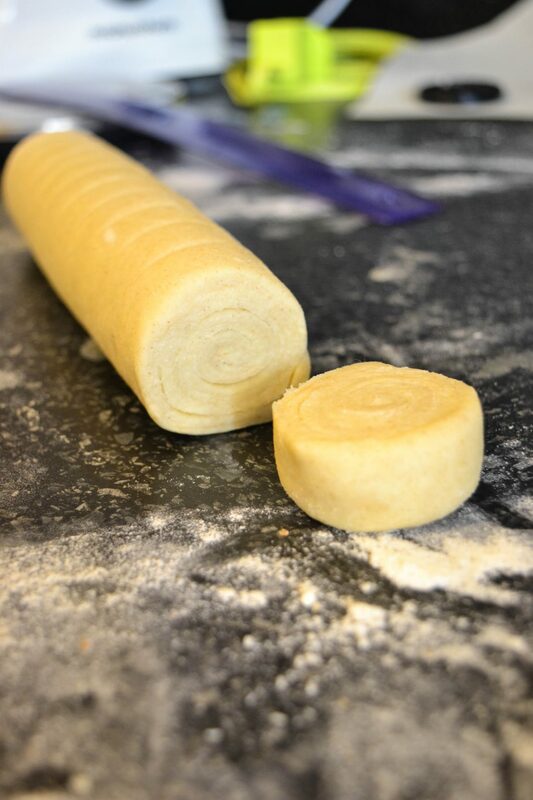 Roll the pastry out on a lightly floured work surface to a rectangle measuring 20cm x 30cm. Roll the pastry tightly, from the short side, into a log and cut the log into 12 even sized rounds. Place one disc into the cup of a 12 hole muffin tin, swirl-side up. 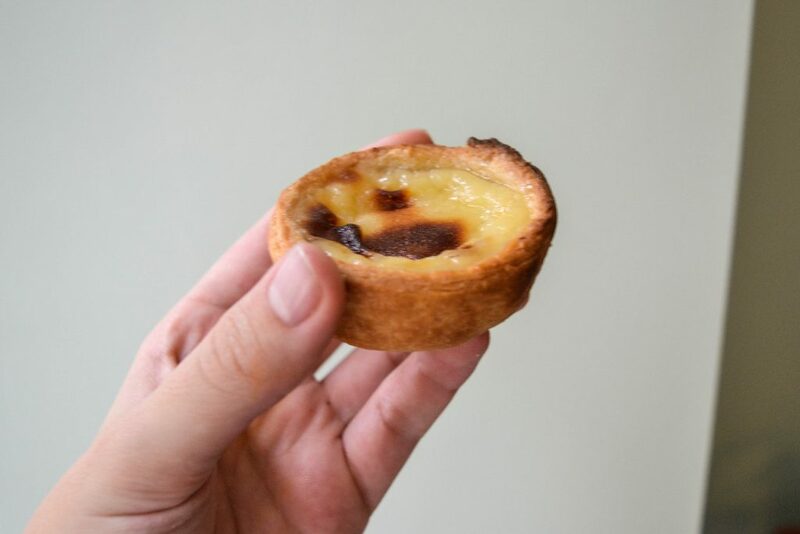 Using wet fingers, carefully press the pastry up the sides with your fingers, working from the centre out, until the pastry just pokes over the top. 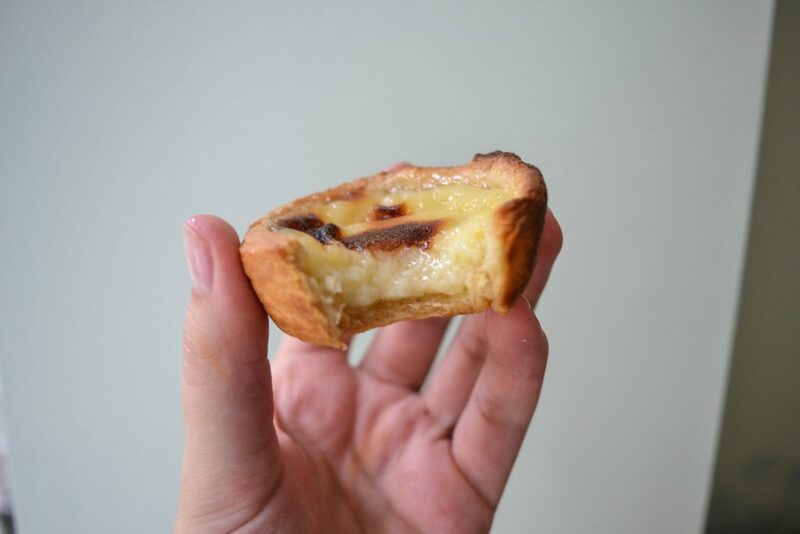 Repeat with the remaining pieces of pastry. Chill for 20 minutes. Pour the milk into a pan and whisk in the flour. Add the strip of lemon zest and cinnamon stick. Bring to a simmer, whisking continuously. Cook for 2-3 minutes until thick. Remove from the heat. Tip the sugar into a small pan with the water. Heat gently to melt the sugar, then increase the heat and boil until the syrup reaches the short thread stage (106C – 112C). Gradually whisk the boiling syrup into the milk mixture. Put the egg yolks in a large bowl and strain over the milk mixture, whisking continuously until combined. Place a sheet of clingfilm over the surface and leave to cool. Once cooled, remove the strip of lemon zest and cinnamon stick. Heat the oven to 240 top/bottom heat. 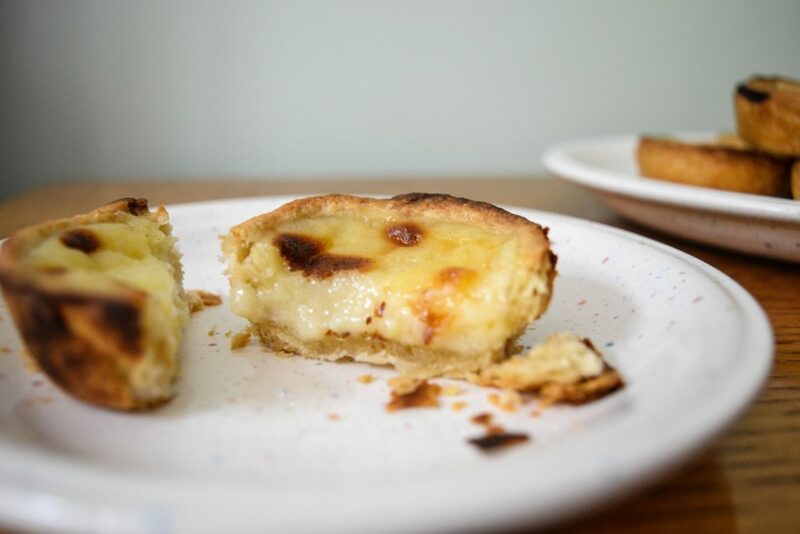 Pour the custard into the pastry cases to 1cm below the top, then bake in the oven for 15 -18 minutes until the pastry is golden and crisp and the custard is bubbling with tiny brown spots. 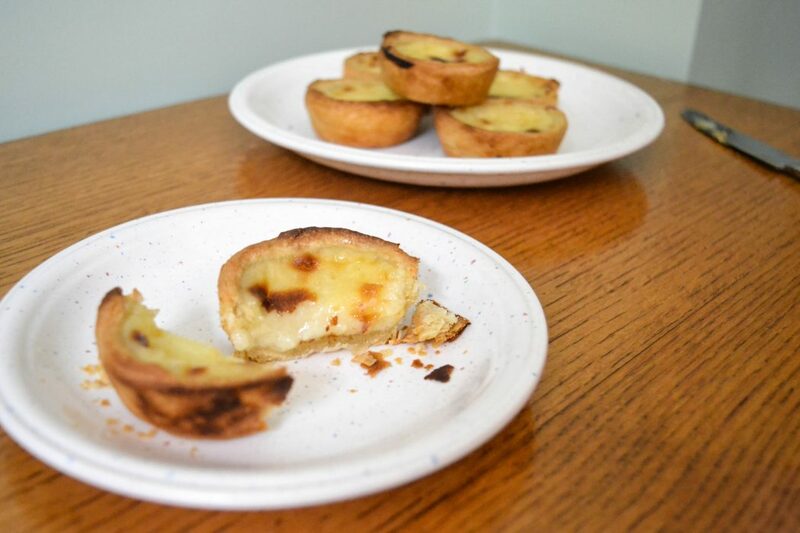 Remove from the oven, cool in the tin for 5 minutes, then gently turn out the tarts and leave to cool on a wire rack. Great post! 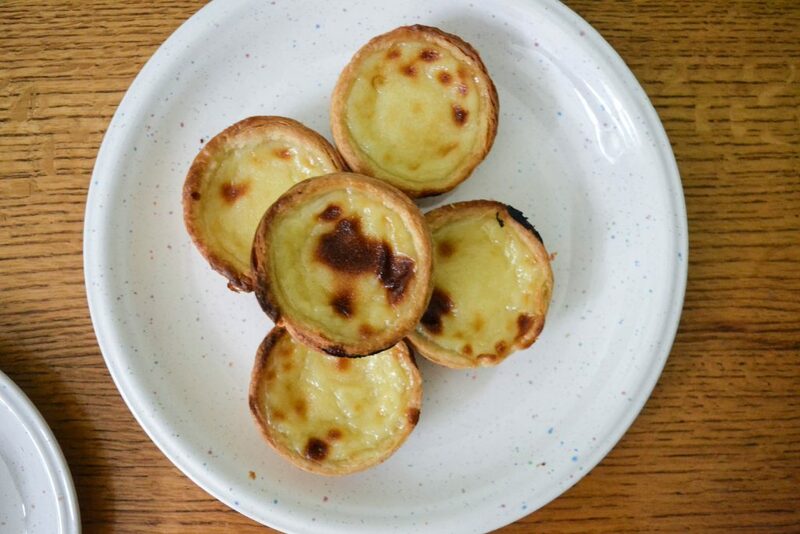 Your Pastéis de Nata look fab. I also had a go inspired by GBBO. Check out my attempt on Taste2taste.com. ? Want to receive our yummy recipes straight in your inbox?